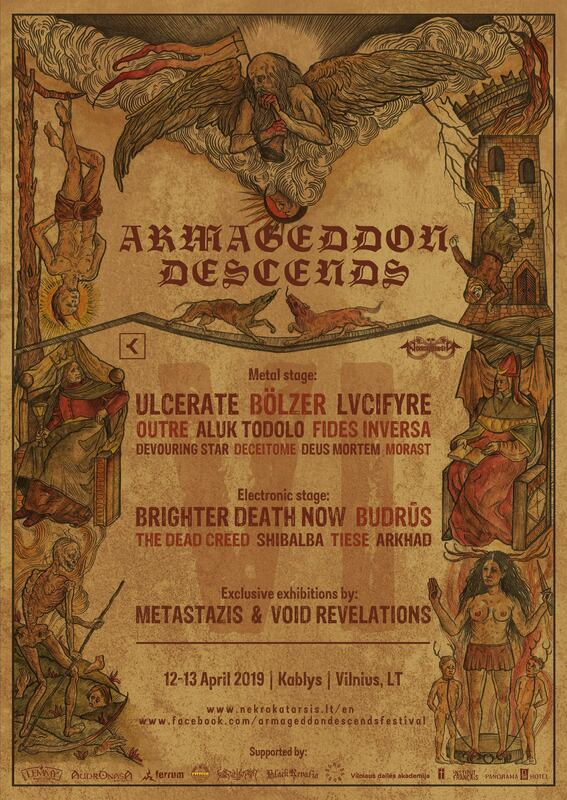 Leading Baltic indoor underground metal and electronics festival “Armageddon Descends VI”, which takes place April 12th – April 13th has announced its final line-up and poster. Sixth edition of “Armageddon Descends” festival will host a wide variety of bands and artists from diverse geographical locations and musical backgrounds. Avant-garde death metal band Ulcerate (New Zealand), a rare guest in Europe, will visit Lithuania to perform one of few select shows this spring. Critics and fans alike acknowledge this is currently one of the most innovative and technically interesting bands in the international metal scene. The renowned black/death metal duo Bölzer are set to accompany them on the headlining slot, and finally present their massive debut “Hero” to the Baltic audience with solid and powerful sound. The festival will host a number of experimental acts. Among them is one of the most famous names in the global industrial music scene – Brighter Death Now. In contrast to the harsh soundscapes of the Swedes, Greek ritual dark ambient act Shibalba will put the listeners to tantric meditations through the darkest corners of the psyche with help of authentic instruments and auras. “Armageddon Descends VI” will take place in Vilnius, Lithuania, at one of the most unique local venues “Kablys” (The Hook). The 6th edition of the festival will run for two days from Friday, April 12th to Saturday, April 13th with additional art exhibitions and film programs starting from Thursday, April 11th. Follow the festival’s facebook page for more news. SOBERNOT releases new music video!